We’re starting to see a lot more of Marissa Webb, Head of Women’s Design at J. Crew. She’s featured in the latest J. Crew video – a fun behind-the-scenes look at manufacturing their shoes in Italy (if you follow quintessence on facebook, you’ve probably already seen this). 1) Don’t be afraid to explore. People get into habits or won’t try something new because they think it’s not right for them. You’d be surprised what does work. 2) Personalize an item. 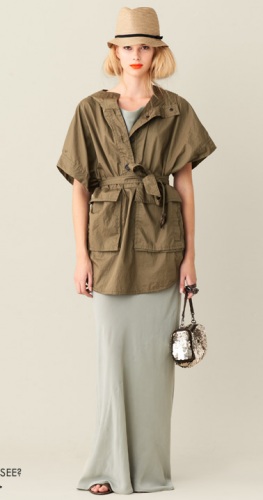 Don’t think you have to wear it exactly the way it looks off the rack. I often have the sleeves of my jackets shortened to a bracelet length just because I like that proportion on me, or have the legs of a pant taken in. 3) Highlight what you like best about yourself. If you have great arms, show them off. Great ankles? Crop your pants to just the right spot. 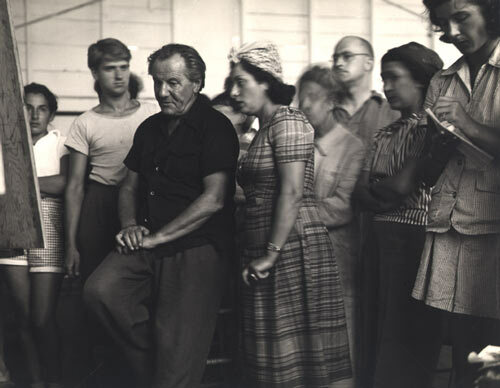 In 1930, at the age of 50, Hoffman moved to to the States where he taught in Berkeley, New York and Provincetown, MA. He was a well loved teacher and influenced an entire generation of artists including Frank Stella and Red Grooms among others. Here he is with a group of students, including Robert De Niro Sr. (the handsome fellow on the left in the white shirt). It wasn’t until his later stage of life that he was able to totally devote himself full time to his art and gain the recognition he deserved as an artist. 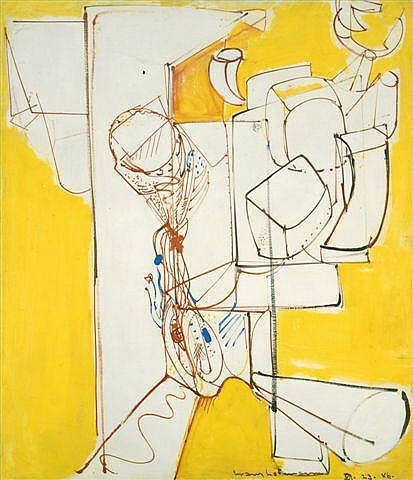 Lowery Sims, the curator of his 1999 exhibit at the Met explained “Hans Hofmann came into his own in the 1950s and 60s when he was in his seventies and eighties… It sort of defies the notion that creativity is only the province of the young. He’s a really great example for people to understand that creativity is a lifelong promise.” Did everyone read that?!! I’ve attached a clip from a wonderful video for those of you interested in learning a bit more about him. This entry posted in art, art history, fashion, J. Crew, learning. Entry Tags: Fashion Inspiration, Hans Hoffman, J. Crew, J. Crew Spring 2011, Marissa Webb Bookmark the permalink. I like the art of Hans Hoffman, but my appreciation grew even more when a client sold one from their collection to pay for a new natatorium. TDC – Wow! And was this a natatorium that others could enjoy as well? I just have to say that you write the best posts! They are interesting, fun and I learn just enough to keep me wondering what more I can find out. Seriously. Maybe blogging is like “continuing adult education” and lots more fun than sitting in a class listening to someone ramble on. Art and Fashion…where would we be without it? Thank you Danielle! I really appreciate these comments as I do try to find topics that are the right mix of style and substance. Oh Jane thank you! I always learn something as I’m writing as well – my day is not complete unless I have added something to the bank of knowledge! She seems to be an asset to J Crew and I am a big fan of their clothes…..I liked her advice on dressing well, nothing I havne’t heard but especially liked the comment about making it your own, I am known for altering things in all kinds of ways to make it look totally different, not to do on purpose but if I feel the scale might be off, I like to “tweak” it. I am not a huge fan of modern art (maybe because admittedly I dont’ understand it) but can see how this collection provided a wonderful fresh inspiration for the latest collection. TEH – I think people don’t always consider alterations – when it’s how you get an ordinary garment to REALLY work for you. Obviously something you’ve already realized. 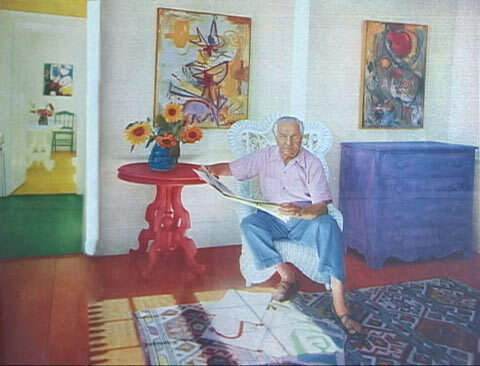 Hofmann is obviously all about color so he was a good choice for spring inspiration. Sarah – J. Crew has made this one of their initiatives – intermingling of art and fashion – whether visual artists, film or music – I think they are just so clever! 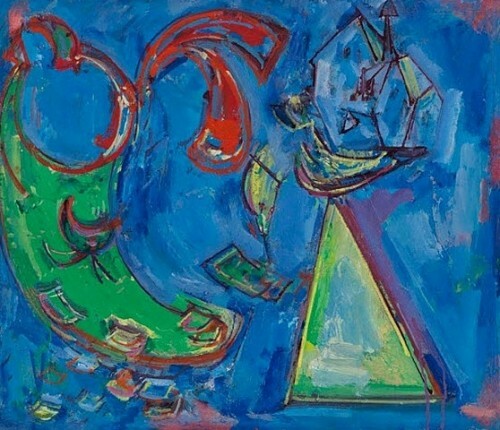 “Hans Hofmann came into his own in the 1950s and 60s when he was in his seventies and eighties… It sort of defies the notion that creativity is only the province of the young. He’s a really great example for people to understand that creativity is a lifelong promise.” we see this time and again from great artists whose best work was later in life…Age truly, TRULY has it’s benefits…. Maureen – TOTALLY agree and someday I’m going to write something substantial about this because it fascinates me. Caroline – thanks! I think you must have to take an art history course before you can become an executive at J. Crew! I must know if you were ever a teacher? I always love your posts and how informative they are. In college, Art History was my favorite class. I am looking forward to teaching art once my studio is complete…. Learning about art at any age is so vital to loving life! 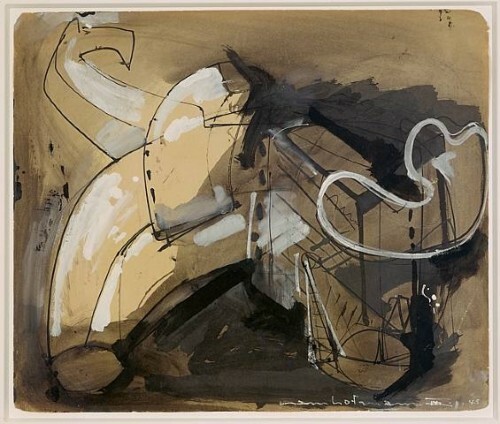 Hoffman is one of my faves….his work is full, rich and playful. SA – Thank you! And agree – that’s what sets you apart. woops. meant to spell Hofmann…. Can’t tell you how many times I had to correct that doing this post!! Um. Those yellow shorts are to die for…can you tell I am craving sunshine? Hi Leigha – Cute right? Yes, this colorful collection is making everyone itch for warmer weather! CCL – Thank you. I just love how J. Crew makes the effort to connect all the forms of creative expression. Thank you!! So glad you enjoyed! I can feel my vision expanding–the video was exactly what I needed for today. Art = expression of the human spirit. Hi Mary – Great! And yes, isn’t that a wonderful quote?! Jeanne – Thank you. I love learning about the designers as well – and the colorful collection is just what we need now – as we anticipate yet another storm! So exciting … love how you tie art and fashion and think it all through. Thank you Madeleine! I love the intersection of the two! Hi Kate – thanks! Me too of course! Thank you for this fascinating post – the subject matter is right up my alley! Hi Anne – So glad you enjoyed!! This is a wonderful post. Love Hoffman’s work!! Such beautiful choices. Teresa – Thank you! 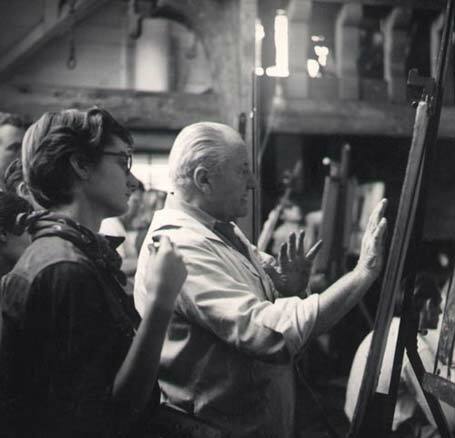 I was thrilled when I read Hofmann was her inspiration – such inspiring work! This is such great style advice, I definitely need to spend more time at the tailor. It is very rare that a garment fits just right, something is always a bit too big or a bit too long. And I LOVE the way you’ve paired the outfits with the art in this post, just lovely! HHGG – Thank you! I think people frequently don’t want to spend the time or money on extra tailoring but it really makes such a HUGE difference. Everyone’s bodies are different and not every piece is going to fit everyone the same! Remember Benneton? The first time I walked into those stores I was wowed by the political statement and the photography. The clothes were what you wore, if you were joining the tribe. I tried, but those clothes never fit me. I agree with everyone else, I always learn new things on your blog. Thanks for the gift. Of course I remember Benetton! And their clothes never fit because they were cut for girls not women!! And glad you enjoyed – we are always on the same wavelength! Thank you for the inside scoop — I think her tips are so true, if something doesn’t fit nicely, you won’t want to wear it. I loved learning about the Hoffman connection. Happy Monday! SM – And little bit of tailoring can make a huge difference! Diana – so glad you enjoyed!! Sometimes we just need reminders about these simple tips! Kelly – love Hofmann as well and I love learning the designers’ inspirations. I wouldn’t have guessed you were so petit – you have such a big talent! Marsha – I guess it’s all relative – they are still in the affordable category compared to so much else! How fun to see someone else behind the “seersucker” curtain at J.Crew. I think her advice is spot on. I often turn Tori Burch’s zip ups around and definitely have to hem my skirts to the right length. What a fun melding of art and fashion – they two really are so very linked! PPT – not surprised to hear that you already take advantage of Web’s advice! As I’m sitting at my computer at 2:00 in the afternoon still in my gown and robe, I certainly don’t feel any resemblance to a fashionista! I had more time to keep myself put together before the computer took over my life. I thought it was supposed to make life simpler. I digress… Would love to put myself together just like these images. I guess I can dream! Oh Mona – I’ve certainly had my share of days like that! MDC – I agree – I think there’s a happy medium of staying current and true to yourself. Read through your post this morning but waited until I could watch the videos to comment. Enjoyed both of them (as always). The first one I liked for several reasons, seeing an artist’s idea translate from one to the other and finally at the end, come to fruition, was wonderful. I also quite enjoyed seeing the people who make those shoes, knowing they come from generations of shoe makers and they are passionate is inspiring – that one women’s manicured hands making shoes made me think I’m lame for not painting my nails because they get chipped when I make jewelry. The thing I liked best about the Hoffman video was of course the vintage feel, the way people were dressed for art class and that there were people of all ages in his classes. Jeanette – Didn’t you love the little trip to Italy – and Jenna’s gelato looked delicious. And yes, loved the vintage feel of the Hofmann clip. nice post! have been following marissa webb for a while now and really love her style. i thought her style tips were spot on. loved the videos too- amazing! Hi Jordan – thanks! So glad you enjoyed – come back any time! What a great post! Thanks for visiting my blog. Come again soon! Hi Kendall – Thank you. My pleasure – always enjoy meeting new people! great post! i loved reading about hoffman and so interesting to get a peek into the inspiration. i agree, love seeing more about marissa webb- im such a big fan! 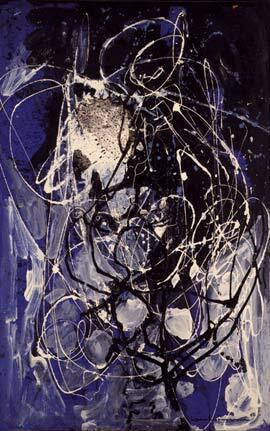 I love the art and fashion connection especially when it comes to being inspired by Abstract Expressionists! 87 queries in 1.568 seconds.